Fairing(sanding) the outside edges of the framing is so much better with a 24″ belt sander than with a power hand plane. I had a hell of a time with the hand plane when I was trying to round out the lateral supports. 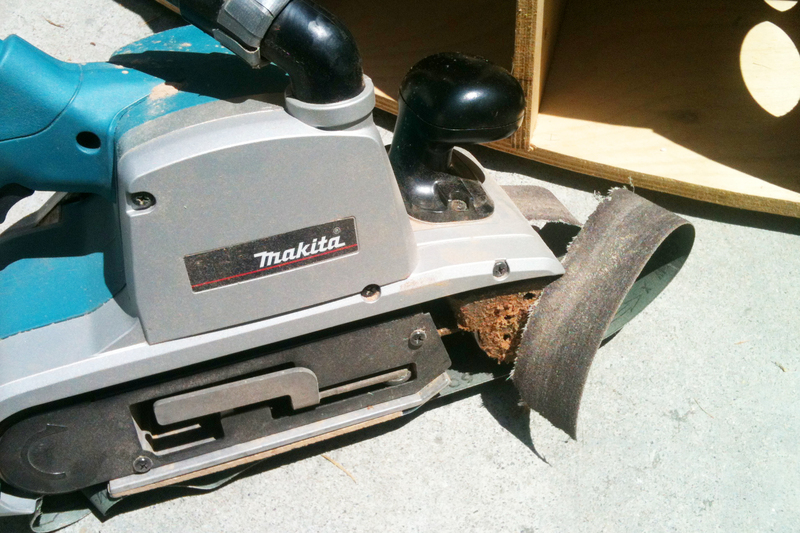 When I started using the Makita 24″ belt sander my life instantly got better. I had to make a custom fitting to make the belt sander marry to my Fein shop vac, but after a little duct tape and some good wishes, I was sanding like nobody’s business. The 60 grit sand paper helps a ton. But… too aggressive buys you a one way trip to blow out city. Scary when it happens, but I have all the safety gear on, so…I’m quick to recover. Rum Rum Rum.